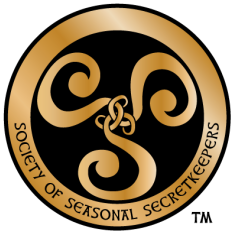 What is the Society of Seasonal Secretkeepers? The field guide is an 80-page book full of encouragement and ideas to help kids transition from "receiver" to "creator and giver" of seasonal magic. The set also includes a beautiful token with the Society's seal. It has been specially minted with attention to detail and quality. It will feel special and important - and maybe a little bit magical - to your child. Reduce the sting of The Mysterious, Maybe Awful Truth. (i.e., just how much help Santa, and the other magical, mythical beings, require from grown-ups.) And that sting can carry a wallop! Just read the author's story to find out how. Discuss and record your family's traditions and beliefs surrounding the holidays. It's important to us that YOU are in control of the values imparted on your child. Build character, and help them understand the responsibility of guarding The Truth for younger kids. Appropriate any time of year. Includes supplemental, online seasonal ideas from The Society to make the experience feel timely and festive. And if your child is really into it? The guide will continue to have new ideas and fun year-round! Design and illustrations are geared to intrigue and enchant. We incorporated ideas from our kids' favorite books and activities, fine-tuning them to make the experience exciting and special. Ideal for kids who found out The Truth in the last year or so, with an age range of about 5-13. A wonderful gift for when they ask the question. Buy it now, and have it on hand when the moment arrives. One day, every child will ask the hard questions. "Santa? The Easter Bunny? The Tooth Fairy? ... What about God?" The Society of Seasonal Secretkeepers is a resource for families experiencing the growing up phase in which kids begin sorting out "truth" from "myth" and try to figure out where "beliefs" fit into the whole scheme of life. Kids become Secret Agents for the Society, learning the importance (and fun) of guarding seasonal magic. The field guide includes the cold, hard facts about parental involvement in seasonal magic, fun exercises designed to help kids understand how the Spirit of the Holidays exists within their real world, a personality test to find out what agent duties fit them, and much, much more. Children will complete the guide feeling empowered with truth and knowledge, with commitment to their new, more adult responsibilities, and with a new understanding and respect for their family's religious values, traditions and beliefs. Field Guide activities will help open dialogue about your family's belief system, providing you opportunity to reinforce the values and truths at your family's core. What is the Society of Seasonal Secret Keepers? You've outgrown your shelf elf. You now understand the nitty gritty details of how Santa can be in every mall all at the same time. The bunny laying eggs finally makes sense. Now it's time for you to become a special agent for the Society of Seasonal Secret Keepers. Are you ready? You must be trustworthy. You must act with maturity. You must guard the secrets.